Lighting is a necessity, but there is no reason it can’t be beautiful or unusual or interesting, depending on the setting. Here are some interesting and economical lighting applications. First, in our case, was a long search for suitable, interesting and practical lighting for the recent expansion of my client’s laundry/service porch in the little house in Pasadena. 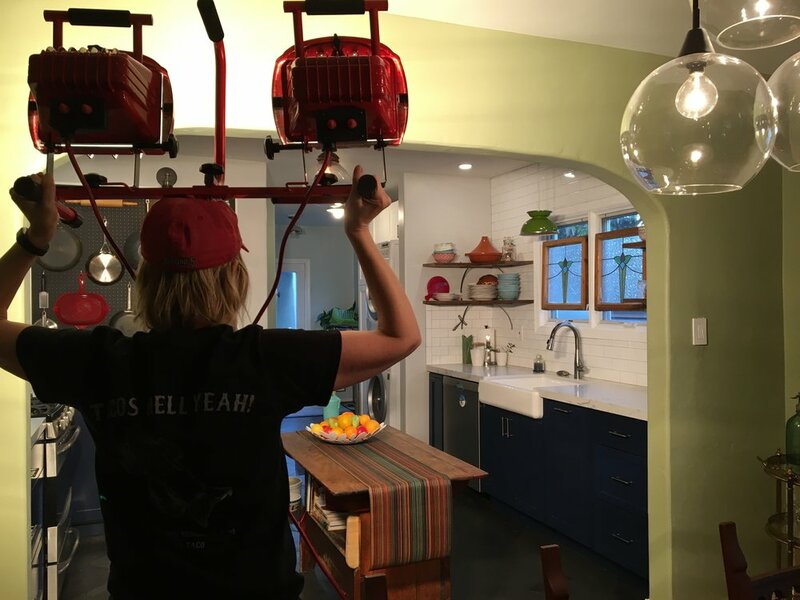 One of the problems we had to overcome was the long pathway from the backyard and garage through the service porch, anticipating the carrying of ladders or other utility objects through the space; and the height of any type of lighting other than recessed, had to be considered. The original light in the service porch was a typical bulb covered by a glass globe of the 1930s, which hung down about six to eight inches from the ceiling. With the new addition, the contractor installed a recessed light, so the inner workings of the two ceiling lights were quite different. This was not a problem for an electrician or a handy husband. The proper adaptations for the “find” of the day a few months ago at the Rose Bowl, were two old, and a bit rusted, fluted funnel cake pans. These old pans would be a nod to the age of the house in the new space, so it would not feel so brand new. The cake pans cost three dollars apiece, and we were notably thrilled with the idea and cost. Unknown to us until just recently, the very same idea at the HD Buttercup showroom on the west side of Los Angeles. The price was significantly more—to the tune of $175 each! While we were a bit disappointed to find “our” idea used, we were delighted in the “savings”. The light above the kitchen sink was constructed out of a an ordinary kitchen colander, cute, easy and not particularly original, but it feels right in the space. The next special find, came from an estate sale, where we located three large chess pieces; of the three my daughter wanted the knight, so handsome with his curly mane; next was the king who was particularly handsome, and we decided he would stand tall on a fireplace mantle or hearth. The third and final piece was the rook. I immediately identified him as a perfect lamp base. I knew my clever husband would have no problem drilling a hole in the top and out the side to run a cord, but it was up to me to find all the various pieces—and I did. The lamp is the best of all three pieces, starting off as the most plain and unassuming, it has taken its place of honor on the night stand, no pun intended. A light can be fashioned out of practically any vessel or container, depending on how much light is needed. The pendant lighting in the back yard has been a terrific hit and so practical, since the shades do not have to be brought in in inclement weather. The next outdoor project will be to cover some very modest and uninteresting jelly jar lights on the exterior of the house. The plan is to fashion covers over the jelly jars to mask their utility and add some interest with more of the punched tin that was used in the outdoor pendant lighting over the patio. While we searched for something suitable, we settled on the modest jelly jars so we could satisfy the city and get a final inspection completed. We knew we could always change them, and they were less than ten dollars each. Adding the covers will disguise them sufficiently and add to the outdoor theme. Recently, we visited one of our favorite old haunts on the island of Kauai, the Grove House, established by George Wilcox, one of the first sugar plantations in Hawaii. I am always amazed at the generous proportions of the home and how seamlessly the additions to the home were incorporated. The ceilings are tall and the verandas are generous, allowing the doors and windows to be open to the trade winds while the interiors are cool and dry, protected from the frequent rains that keep the island so lush and green. Many of the necessities of farm life in the mid-1860’s were incorporated into the home, and are still in use today. The kitchen, while modest by today’s standards, is efficient and serviceable. They still use the old wood burning stove, which keeps the kitchen quite warm, even in the summers! The kitchen has a composting bin, which is air-cooled to the outside, which keeps unpleasant odors from accumulating. It is handy to remove the waste to the outside compost pile. While composting is making a comeback today, having outside access might be a good thing, but probably less practical in today’s kitchen. Dishtowels air dry under the sink while hanging on dowels that slide out for easy access. This is a convenience that continues today in many forms, proving that some old ideas are well worth preserving. I have always loved the pots and pan storage ideas employed at Grove Farm, not that they are unique to this home, as many homes of the era made good use of the space. The practical storage of platters and cutting boards, separated by thin vertical panels makes perfect sense no matter what century you are living. Several years ago, when we replaced our builder wall oven, for an under-the-counter oven, wide enough for just about anything, we had to deal with the old oven cavity. It was no problem for me with handy hubby willing to take on the task. I had been wanting to get cookie sheets, platters and other awkward sized cooking pieces out of dark, hidden cabinets and up where I could reach them easily. The solution was to add the vertical dividers to separate cutting boards, platters and cookie sheets. Above the newly acquired storage, I had more space, and handy hubby added a horizontal shelf, high enough to allow for storage underneath for more frequently used items. On the added shelf, I store all the long boxes for parchment paper, aluminum foil and plastic wrap. These are easy enough for the vertically challenged to reach, as long as you don’t push them too far back when returning them to the shelf; however I do keep a collapsable step stool between the cabinet and refrigerator just for retrieval purposes. On the uppermost shelf, which not not many can reach, I keep the lesser used kitchen items. To make the best use of your space, you must first determine how you want your space to serve you, then break down what can be added or deleted to serve your purpose. Having a handy hubby around, admittedly is one of my most prized gifts; but you will find lots of folks willing to take on the task for a reasonable fee. I think finding the space is the most challenging problem; but if you have a space that isn’t working well, think about how it can better serve you and go from there. We are fortunate when we can enjoy a combination of positive effects on several of our senses at the same time. In the world of design, our senses of sight and touch offer pleasures, but our sense of smell is a likely third; it is oh so satisfying when flowers and greenery produce color, scent and texture all at once. Bringing the outdoors in is a goal for most of us living in a temperate climate. While I am not a landscaper, I do know what I love to see and smell and Salvia Clevelandi, Winifred Gilman is a favorite for my eyes. I love it in the garden near an open window or door, so I can take in its lovely scent whenever a breeze comes up. I like to make good use of plants in decor by using the real thing, whenever possible. Even dried plants can give off a pleasant fragrance in dried arrangements, or tied in a bundle and hung in a closet or shower. I like to use eucalyptus branches in these areas as well, especially hung in a shower; the steamy atmosphere helps bring their sweet, fresh scent into the surrounding areas-- for me, truly heaven sent. Even a particularly lovely piece of furniture that needs protection from water spillage can be enhanced with a dry arrangement of local native or succulents as a centerpiece. One should never water a succulent on a table top; it should always be watered sparingly and on a surface that can be easily wiped up. Once the water has settled in the container, there is no danger of leaching moisture onto the surface of the furniture. An arrangement can sit for quite a long time, and infrequent watering will make a happy situation for both plant and table top. Lavender is another favorite, both in the garden and in the house. These plants do well in our dry climate and are a favorite to dry and use as a sachet for drawers. Let me mention rosemary as well, which adds another sense, the sense of taste. Rosemary’s flavor adds to many savory dishes. Growing theses plants makes it easy enough to snip off small branches to bring into the house frequently, to add to an arrangement of roses or to use all by themselves. One of the great characteristics of these plants is their structure. They offer so many opportunities to display them creatively. They look lovely against a plain wall, or one enjoy the shadows they cast in the evenings. In addition, they bring fragrance to the room and the soul. With their color, scent, texture and taste, they have the makings of a long lasting and beautiful arrangement. You just never know where you will find the next great thing! Tag sales, garage and yard sales, flea markets and sometimes the side of the road can be the most unlikely places you will find just what you are looking for, albeit not as recognizable in its current form as you imagine. Maybe you are looking for a particular object and maybe you are just looking at interesting things, but when you stumble upon something that is out of the ordinary you need to take advantage of the moment. Recently, while shopping at the monthly Estate Sale I like to frequent and, after a quick pass through, a second tour landed me at this old carpenters work bench. When my client found me, she noted that she too had looked at this same item. It is a bit low for a typical kitchen cart or island, but when you are vertically challenged as many are, it is nearly perfect. My client has been looking at kitchen carts on-line as well as checking out new carts in trendy shops around town, but nothing really hit the spot until we pondered this old work bench. Just imagine the history that this piece might tell if it could. when you have to unload half a cabinet to get to the piece you need. With those items off the valuable shelf space, everything is easier. The bench’s surface area is the perfect size for an additional work space for chopping vegetables or mixing a batch of cookies, it is the perfect height for a small stool and rolling out a pie crust while standing. Of course, no food is placed on top of the table without a cutting board or some protective surface for cutting raw foods. Good sanitation demands care. However, there are no worries about putting a glass on top that may sweat or a bottle of wine that may stain a nicer countertop. A piece such as this is great in a vintage house, but it would also fit in a more modern kitchen as a useful accent piece to add warmth and a sense of history-- a nice change from the stark, utilitarian look. We have considered adding a couple of inches to its height by adding casters, but so far the piece suits the needs of the cook; the taller cook can use the other surfaces in the kitchen. The bench has found a new and unexpected use in this vintage kitchen; a perfect compliment to the two cooks that can now work happily in unison. I am not certain that Julia Child was the first person to think of peg board in the kitchen, but it certainly became a popular idea as seen in the recent movie, Julie and Julia and was the inspiration for this vintage kitchen. My client’s kitchen probably was a very satisfactory work space in 1930, with an ice box taking up some space and cold storage near the buffet. However, in today’s kitchen the refrigerator was a huge obstacle to get around and made an otherwise comfortable workspace for two or three people, a one person kitchen. The answer was to move the refrigerator around the corner and into what had been a small pantry in the laundry room. This answer required the partial removal of a wall that separated the kitchen from the laundry room as well as the removal of the pantry walls in the service area. By removing about 18 inches of wall space behind the refrigerator along with the header above the door that lead to the laundry room, and adding a full glass patio door in the laundry area, the kitchen became a light filled, open and more modern work space. The refrigerator was rotated 45 degrees and moved into the expanded laundry room. Moving of the refrigerator has been a long-standing plan for my client, and now that it has been accomplished, the floor space seems to have doubled, as three people can comfortably work in the space. Storage was still an issue for this small kitchen, and that is where Julia Child’s idea to hang her most often used pots and pans on a peg board comes into play. My client had a contractor remove walls and extend the laundry room and add the full glass door, but the peg board was a fairly simple task to tackle with a drill, and some furring strips to allow space for hooks behind the peg board. While Julia’s kitchen peg board was the iconic aqua of the 1950‘s, today’s kitchen enjoys a practical application of blackboard paint; the plan is to outline the pots and pans, as Julia did, with a chalk pen. My client plans to experiment with pots and pans for a little while to make sure everything hangs in the most convenient place. One the two cooks has the reach of a typical six footer and the other, who falls far short of that lofty reach. The addition of trim around the peg board was a finishing touch, purely for aesthetics. My client plans to add an additional work station below the peg board, but for now a narrow bookcase serves as a place holder as well as attractive storage for cook books and some bulky pots that have no place in the already packed cabinets. This is a clear case of using something you already have, in a new way. It is often beneficial to think outside of conventional uses for furniture pieces; bookcases can go almost anywhere, they are great storage units. One of the most sought after living styles today is the open space concept with the living room, dining room, and kitchen prep area all in one large room. With today’s lifestyles, this concept makes a lot of sense. Compare it with days gone by, where the cook was confined to the kitchen and the guests and family were elsewhere in the home. Formal dining rooms are not the norm for today’s more casual dining; they are nice if you have a very large home with staff doing the cooking and serving, but this arrangement is not so common today. The beginning of the open space concept may have begun with a pass-through from the kitchen to the dining room. The pass-through may have been revolutionary in its day, but it is a bit too closed in for today’s living. One of the first things most people have to decide when considering the removal of an upper wall, is the cabinetry on that wall and where to store what is in those cabinets. The same is true when considering removal of floating cabinets over an island or peninsula. It may be wise to open the cabinets, evaluate what is stored in them and determine where else the items can be stored. You may even find a lot of things you considered “lost” because they were unseen and not easily accessible. The things you still need and use, albeit less frequently, can be stored in other cabinets. This exercise forces you to really access the items need to be in your home; so making careful choices is important. If you happen to have such a pass-through and wonder how to modernize it or truly open the space, there are few things you need to consider. First, you will want your kitchen to be attractive and uncluttered enough to be on constant display. You will want your cabinetry to coordinate with the rooms to which it is open, i.e. family room, dining room. If your cabinets are old, outdated or shabby, painting will be the easiest fix. You can consider removing some of the door fronts and keeping some open cabinetry on upper cabinets for some of your pretty or frequently used utensils. The most important thing to keep in mind with open shelves, is the view you will present to the rest of the room. Another consideration is the lighting that will be visible from the living spaces into the kitchen area. A new, attractive light fixture might be a nice accent to add to the kitchen. Color will be another consideration; you will want the two or three combined spaces to be cohesive. The rooms need not be the same color, but they should coordinate; consider a bolder value of the same color from room to room or a graduated value of color among the three rooms. Color too will give an open concept a subtle room division. The pass-through kitchen will require some amount of DIY skill, or you can hire a contractor. You will need to determine if the wall separating the kitchen and other rooms is load-bearing before you swing the sledge hammer. There may be electrical wires or plumbing pipes in the walls, so go slowly and check in the attic or have someone who is skilled in construction help you determine these issues. Oftentimes, a post or pillar will be necessary to hold up the end of a load-bearing wall. When you have cabinets on the kitchen side of the pass through wall, you will want the cabinets to remain for storage, so a half wall will be your division between the rooms, still giving you a visual open space. A half wall may give you an opportunity to have a console on the living room side of the half wall, to be used for games or if it is a dining space, a buffet server for parties. Removing the entire wall between the kitchen and adjoining room may be more ambitious than the average DIYer can manage, and there are more things to consider. For instance, you will have flooring issues to deal with, as the removal of a wall will leave a two-by-four or two-by-six space where the wall once was. Leaving a partial wall would not necessarily require new flooring or patching. The ceilings in both renovations will need to be addressed, but dry wall is more easily applied than flooring with the necessary matching. Removing cabinets above an island and peninsula can be among the most liberating and enjoyable renovations one can undertake.